at Vandy 49%- This game is truly a coin flip and the only reason I gave Vandy 1 extra % is because its at home. It’s funny how huge this game is and how much it affects the rest of the season. A win could bump the remaining percentages by 10% but a loss could drop them by 10%. vs Southeast Missouri 99%- There will be a party in the grove this day. The Redhawks don’t have a chance. at Texas 40%- The Longhorns will probably be favored but I think the Rebs have a pretty good shot here. If Ole Miss can fix their defensive performance from the meeting last year in Oxford, an upset would not shock me. at Bama 15%- This is a very long shot. 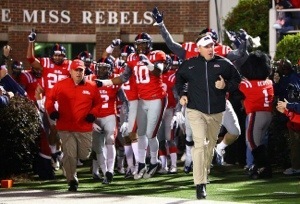 I’ve already seen 2 OM bloggers ( hottytoddy.com & Seph something on Bleacher Report) pick the Rebs. First off, going to T-Town and knocking off The Crimson Tide is almost impossible. Second, the Rebs don’t beat Bama. All time record is 50-8-2 and Ole Miss has won 3 times in the last 30 years. at Auburn 45%- This one looks a bit controversial on the surface. Look deeper. Ole Miss comes off a slug fest at Bama and Auburn comes off a bye week. Auburn will be much improved from last year. I give Auburn the slight edge because of home field and the extra week to prepare. vs Texas A&M 37%- This is a game that the Rebs should have won last year and A&M played a terrible game but turnovers saved them. This game should be a shoot out. Ole Miss comes off 2 straight really tough road trips and gets rewarded with Manziel in Oxford. Somehow this is Pete Boone’s fault. vs LSU 40%- I’ve picked LSU 2nd in the west so I have to have them winning here. Doesn’t mean I feel good about it. LSU lost a lot and make no mistake, this is a very winnable game. Traditionally Ole Miss plays LSU very tough. The main reason I have LSU favored is scheduling. This is the tail end of murders row. vs Idaho 99%- Finally a break from the insanity. This one will be a massacre. Big win for Rebs. vs Arkansas 90%- The Hogs should be much improved but they simply do not have the offensive firepower to compete with Ole Miss. Look for a wide margin of victory in Oxford. vs Troy 90%- The Trojans have a really nifty spread offense (11th nationally in total offense) and have been known to give SEC schools trouble. That said, they won’t win in Oxford. vs Missouri 66.6%- I don’t think Mizzou is capable of going and getting a tough SEC road win. They’re decent on offense and average on defense. That’s not a good recipe facing Hugh Freeze’s offense. The thing I don’t get is the 2 bloggers I mentioned in the Bama description have the Rebs losing this one. How do you beat Bama on the road but lose to Mizzou at home? Rebs roll over the Tigers in Oxford. at Mississippi State 30%-This will be the main one Rebel fans will disagree with me on and that’s fine. I think Freeze ignited the rivalry fire and MSU plays inspired ball. Traditionally in this series, the home team wins. Quick Analysis – First thing is whoever made this schedule should be strung up. The first 7 are ridiculous. Auburn, LSU, & A&M are all winnable games but being sandwiched in that stretch like they are makes them collectively more difficult. The schedule ends much better so the first 7 will tell the tale. I can’t say enough about how big Vandy is. Win that one and they take off. Lose that one and the next 6 games are depressing. Solely based on my %’s I think Ole Miss has 5 wins in the bank. Texas, Auburn, A&M, and LSU are all close to being swing games. Split those and the Rebs are golden. Drop all 4 and it gets dicey. I think Ole Miss definitely gets 5 wins. They will probably find a way to get 6 and return to a bowl. 7 is doable but 8 is pushing it. 5-7 wins is their sweet spot with 8 being a possibility. Anything more or less than that and I’d be surprised. This entry was posted in Sports and tagged Football, Hugh Freeze, Ole Miss, predictions. Bookmark the permalink. How Big (figuratively) is the Davis Wade Expansion? How Much Should Mullen Play True Freshmen?